Exotic and unique, the print on this Shell is unlike anything else Miche has dreamed up! Inspired by Turkish architecture and the colors of a holiday on the Mediterranean, the Jasmine Shell for Miche Classic Bag will swirl and twirl its way into your heart and become a striking addition to your Miche collection. 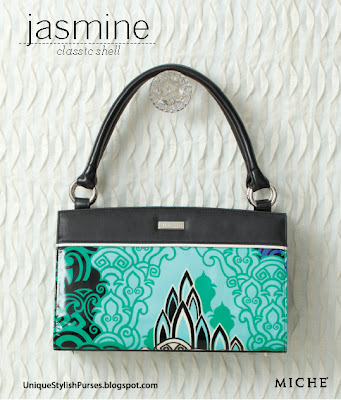 Shades of sky blue and indigo faux leather contrast with cream, black and emerald green for a one-of-a-kind look. Pure white accent adds the perfect touch.